Brisbane-based Kildare boxer Dennis Hogan hopes to take one more and hopefully the final step towards a WBO Middleweight world title fight this weekend. Hogan steps into the ring with Manchester boxer Jimmy Kelly on April 7 fighting for Kelly's WBO Intercontinental belt while defending his own WBO Oriental title at Brisbane's Convention Centre. 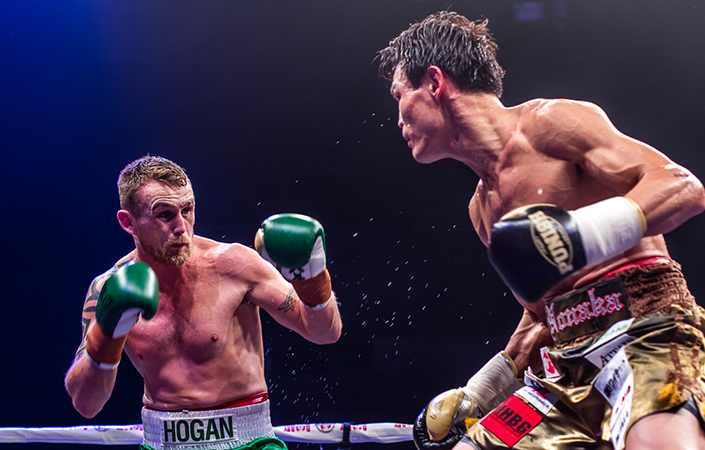 Hogan has been moving closer to his title shot and has been boosted with his elevation to number two in the WBO rankings, a ranking that will strengthen his chances of a world title challenge coming next if he overcomes Kelly. Kelly has also been lifted to number three meaning the winner of the Brisbane fight should be next in line to fight the winner of champion Sadam Ali and Liam Smith's title fight in New York on 12 May. Hogan's training partner, world champion Jeff Horn, will be ringside after his bout with Terence Crawford was pushed back due to Crawford injuring his hand. Hogan is hoping to eventually fight for a world title in the Australian city he has called home for nearly seven years. "We do want to get it here, it's not the be all and end all if we don't but we are aiming for that and we're willing to do whatever it takes to make that happen," Dennis told The Irish Echo recently. "I'm focused on being world champion and when I'm world champion, my main goal is to get the title and to go and defend it in Dublin the 3 Arena. That's always been my goal. I have my song picked out (Puff Daddy's I'm Coming Home) and I have since I went pro. I have all that set in my head, I visualise it and I see it and I feel it and it's only a matter of time until it all happens." Having long had the support of the Irish and wider community in Queensland, Dennis has recently started to get coverage in Ireland. One who sent a supportive message was Conor McGregor's trainer John Kavanagh, whom Hogan met in Australia. It's seven years in January since Dennis came to Australia. With Ireland in a bleak recession, he was like many young Irish who made the move down under in search of opportunities and it is a country that has been good to him. "I really did only plan on being here a year and moving on. It's a beautiful place to live: great people, beautiful weather. Everything just clicked and I can't stay away from it now. I've been in New York for fights, Miami for training camps but it's always great to get back to Brisbane. It's my home now. My heart lies in Ireland but this is where I live, I love it."